Endangered Snake River sockeye salmon are regaining the fitness of their wild ancestors, with naturally spawned juvenile sockeye migrating to the ocean and returning as adults at a much higher rate than others released from hatcheries, according to a newly published analysis. The analysis indicates that the program to save the species has succeeded and is now shifting to rebuilding populations in the wild. Biologists believe the increased return rate of sockeye spawned naturally by hatchery-produced parents is high enough for the species to eventually sustain itself in the wild again. "This is a real American endangered species success story," said Will Stelle, Administrator of NOAA Fisheries' West Coast Region. "With only a handful of remaining fish, biologists brought the best genetic science to bear and the region lent its lasting support. Now there is real potential that this species will be self-sustaining again. The sockeye didn't give up hope and neither did we." Biologists Paul Kline of the Idaho Department of Fish and Game and Thomas Flagg of NOAA Fisheries' Northwest Fisheries Science Center report the results in the November issue of Fisheries, the magazine of the American Fisheries Society. These findings demonstrate that the program to save Snake River sockeye can indeed reverse the so-called "extinction vortex," where too few individuals remain for the species to sustain itself. 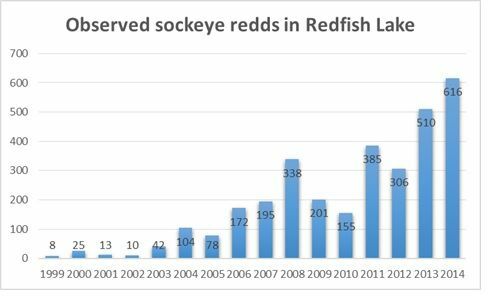 Some thought that Snake River sockeye had entered that vortex in the 1990s, highlighted in 1992 when the sole returning male Redfish Lake sockeye, known as "Lonesome Larry" captured national attention. NOAA Fisheries earlier this year released a proposed recovery plan for Snake River sockeye, which calls for an average of 1,000 naturally spawned sockeye returning to Redfish Lake each year, with similar targets for other lakes in Idaho's Sawtooth Valley. About 460 naturally spawned sockeye returned to Redfish Lake this year - the most since the program began - out of an overall record return of about 1,600. The article in Fisheries recounts the 20-year history of the scientific program to save the Snake River sockeye. The program began with 16 remaining adult sockeye - 11 males and five females - taken into captivity from 1991 to 1998. Through advanced aquaculture techniques, the program has retained about 95 percent of the species' remaining genetic variability, while boosting surviving offspring about 2,000 percent beyond what could be expected in the wild. Without such advances, the scientists write, "extinction would have been all but certain." The program funded by the Bonneville Power Administration has released more than 3.8 million sockeye eggs and fish into lakes and streams in the Sawtooth Valley, and tracks the fish that return from the ocean. Hatchery fish returning as adults have also begun spawning again in Redfish Lake, increasingly producing naturally spawned offspring that are now also returning. A new analysis of those returns shows that the naturally spawned sockeye are returning at rates up to three times higher than those released from hatcheries as smolts, and more than 10 times greater than those released as even younger pre-smolts. The higher returns indicate the naturally spawned fish are regaining the fitness the species needs to better survive their 900-mile migration to the ocean, their years at sea, and the return trip to Redfish Lake. A salmon population must produce at least one returning offspring per adult to sustain itself. Naturally spawned sockeye have returned at more than twice that rate in some years, indicating that under the right conditions they can not only sustain the species but add to it. The results also suggest that hatchery-produced sockeye may regain the fitness advantages they need to sustain their species in the wild much faster than had been previously estimated, the scientists reported. Biologists caution that the current results span only three years so far, but indicate that fitness - and, in turn, survival - can improve in as little as only one generation in the wild. "We hoped we could get returns equivalent to what you'd expect to see from a hatchery," said Flagg, manager of the NOAA Fisheries Northwest Fisheries' Science Center's Manchester Research Station. "We've seen the population respond even better than that, which bodes well for the idea that the lakes can produce the juveniles you'd want to see to get to recovery."